If arriving outside of these times please phone or text 0409 658 209 in advance to arrange a mutually suitable time. Christmas / New Year / Easter bookings full payment required 7 days prior to arrival. If using Diners and Amex cards a 3% surcharge will be added to the full amount of your booking. Smoking is not permitted inside Undine Colonial Accommodation. Any guest found in breach of the non smoking policy may be charged additional cleaning fees ($200minimum charge) and loss of revenue compensation. The number of guests should not exceed the number stated on the Confirmation Notice. Additional fees of $60.00 per person per night will apply for excess guests not notified to the operators in advance. Saturday & Sunday from 6pm till 8pm. The Billiard room is open till 9.30pm daily. Rooms are serviced every 2nd Day between 9am and 11 am. All rooms are to be left in a satisfactory clean and tidy state. Any damage, breakage or loss of furniture, furnishings will be charged at cost. In the event of excessive cleaning requirements, an extra cleaning fee will be charged to the guest’s account. 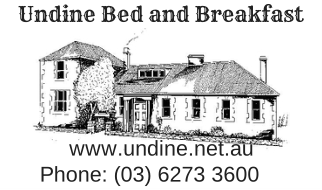 No cooking or food reheating facilities are available at Undine. The number of beds used should not exceed those stated on the Check in Registration card. For each additional bed used there is an extra $40.00 charged.